Application: Used for agriculture spray liquid formulation of insecticides, fungicides and pesticides. 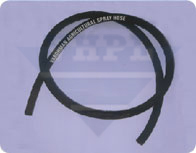 Lining : Uniform seamless lining consist of oil resistance rubber compound. Reinforcement : Plies of rubber impregnated textile or braided textile reinforcement consists of natural or Synthetic fibre. Cover : Smooth, cloth marked finish, made from suitable rubber compound. Pressures: Type 1A & 1B WP 10 kg/cm2 and BP 30kg/cm2. Type 2A & 2B WP 20 kg/cm2 and BP 60kg/cm2. Type 3A & 3B WP 40 kg/cm2 and BP 120kg/cm2. Type 4 WP 55 kg/cm2 and BP 165kg/cm2.